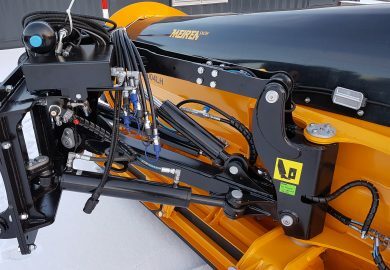 Working width up to 8,5m – The unique patented parallelogram enables shifting the plow sideways and lifting the entire plow. Sideshift gives the driver more options to manoeuvre the front plow. Combined with Meiren 5.5 m sidewing the working width is even up to 8,5m. Economical use of the blades – The lifting cylinder helps to lighten and press the plow as required, ensuring an extremely economical use of the blades. Less salt – Maximum copying of the road surface and hydraulic additional blade mechanism ensures a clean road surface even when plowing just once, which reduces the necessity of using salt.